Now that he has proposed, and you said yes, it is time to make everything a bit more official! In the Middle East it is very common to throw a big engagement party after the groom and his parents ask the bride's parents for her hand in marriage. Once everything is settled, both families start throwing pre wedding parties, and the main pre wedding event is of course the engagement party, which comes before the Katb Ktab or official marriage ceremony. Being engaged is one of the most exciting phases in your life, its fun, romantic, and exciting, this is why you should have fun, enjoy it, and definitely celebrate it. And of course once you get engaged their are many dresses and outfits you need to prepare and set for all your pre wedding parties. When it comes to choosing your engagement dress and making sure you are choosing the right dress for you, there are many things to take into consideration, and we are here to help you find and decide on the perfect engagement dress. Keep in mind the season you will be getting engaged in, for example if you're getting married during summer or spring, light colored or blushed colored dresses are a nice option, as for fall and winter seasons, you can surely go for darker colors. 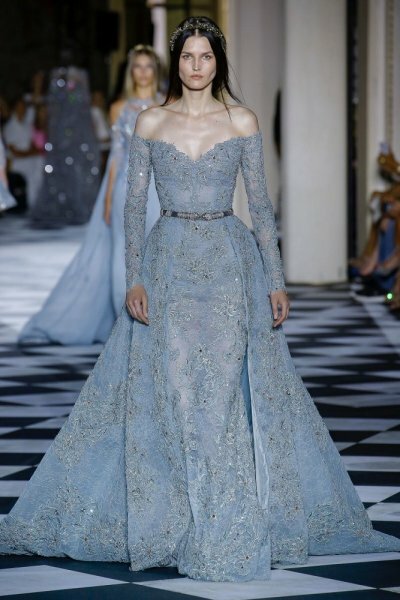 Take a look at this stunning dress by Lebanese and international fashion designer Zuhair Murad. Some couples throw their engagement party during Valentine's while others get engaged around Christmas, you can include some touches in your look, a red dress for Valentine's day, or a dress gold glittery dress for a New Year's Eve engagement party, you can get as creative as you want. For example, take a look at this Valentine's Day inspired dress by Pronovias, its elegant. timeless, and perfect for the occasion. Keep an eye on the latest fashion trends, every year fashion designers release their new haute couture collections, and it is easy for you to see what colors, styles, and designs are trending, you can always get inspired by the designs and choose something that suits you. From sparkles and glitter, minimal dresses, to metallics and one shoulder dresses there are plenty of trends that suit every bride to be. We love this emerald green dress by Ziad Nakad filled with sequins and beads. Everyone has their favorite celebrity, whether Arab or international there are many amazingly stylish celebrities that share their looks at events, red carpets, and parties, and they also share all the details behind their look so you can easily know who dressed them. We are always sharing some amazing dresses worn by celebrities to give you some inspiration.